For my recent Hen day, I made a salad buffet because I know my mum loves salad and it worked out really well. I recently got married in New Orleans and we had a wedding cake included with our ceremony package. 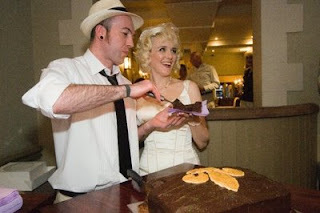 Obviously it was just a 'normal' wedding cake and so we could have pictures done of us cutting the cake, I had to fake eating it by just having a bit of the icing! Rubbish! So, I decided that for our reception, which we held in Cardiff I'd find someone to make me a wheat free cake. I'd remembered seeing a seller on EBay specialising in food for people with special dietary requirements and luckily found the shop in my favourites.